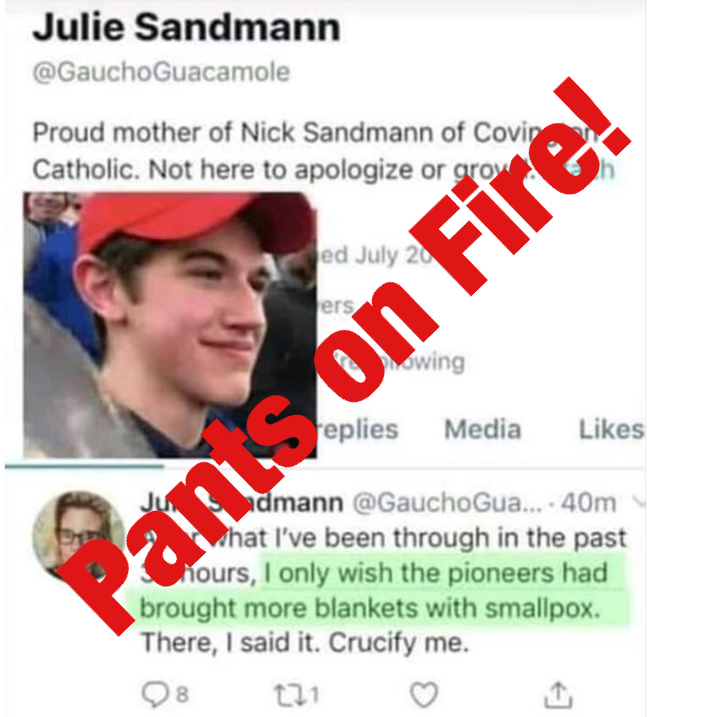 Says the mother of Covington student Nick Sandmann said "I only wish the pioneers had brought more blankets with smallpox." By Ciara O'Rourke on Thursday, January 24th, 2019 at 12:18 p.m.
A Twitter account posing as the mother of a Covington Catholic student post incendiary messages. A viral video that appeared to show students of Covington Catholic High School facing off with a Native American man prompted allegations of racism and criticism of the media. But some social media users are sharing doctored photos that steer the narrative even further off course. Teens from the all-boys school in Kentucky were attending the March for Life in Washington, D.C., when they were captured on video Jan. 18 wearing "Make America Great Again Hats" while surrounding Nathan Phillips. The encounter led publications to publish video footage with headlines like "Kentucky teens wearing ‘MAGA’ hats taunt Indigenous Peoples March participants." Videos that emerged later showed the encounter happened after black protesters shouted slurs at the students. That same day, a purported screengrab of the Twitter account of a mother of one of the boys appeared online. The account appeared to belong to Julie Sandmann. The bio reads: "Proud mother of Nick Sandmann of Covington Catholic. Not here to apologize or grovel. #faith"
A photo of Nick Sandmann — the youth who the viral video showed staring directly into Phillips’ face while Phillips drummed and sang the American Indian Movement song — blocks how many tweets the account has sent, but two appear in the photo. "After what I’ve been through in the past 36 hours, I only wish the pioneers had brought more blankets with smallpox," one says. The other: "This man has been proved a LIAR! ‘Never trust an Indian’ maybe there’s a reason people say that have you ever thought of that?" The account no longer exists, but if you search for the account’s handle, @GauchoGuacamole, the first Google result shows it belongs to someone other than Julie Sandmann. Rather, the account is attributed to "Soccer Dad." The bio says: "Proud father of #2 ranked U12 soccer player in Southern New Hampshire youth soccer conference." Google still shows snippets of some of the account’s earlier tweets, such as "I hope Pence goes to prison…" in Nov. 11, 2018, and "Everything Donald Trump touches dies." One Twitter user caught on before @gauchoguacamole disappeared from the platform. "Everyone is posting a tweet by Julie Sandmann, but look at the Twitter handle," the person tweeted. @gauchoguacamole is just trying to add fuel to the fire." This claim is bogus. We rate it Pants on Fire! Published: Thursday, January 24th, 2019 at 12:18 p.m.